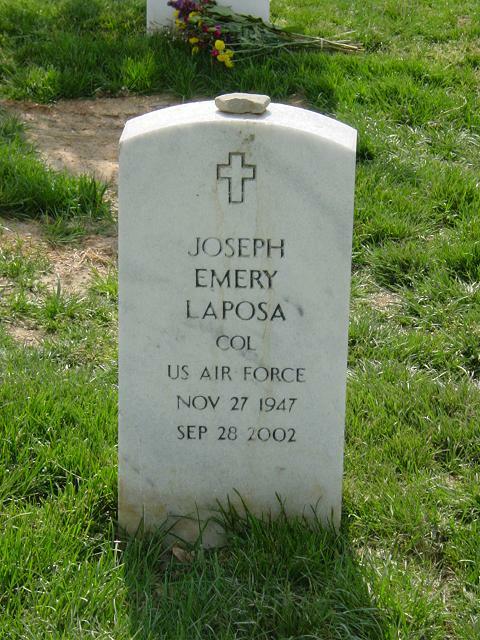 On September 28, 2002, Joseph Emery Laposa of Manassas, Virginia, who retired as a Colonel in the United Sates Air Force in June 2001, after 30 years of service. Beloved Husband of Joanne Laposa; devoted Father of Amy Miller, Tara Laposa and Marcy Laposa; dear son of Emery and Mary Laposa; loving brother of Mary Laposa and Jim Laposa. Also survived by two grandchildren, Madeline and Emma Miller. Services at St. Charles Catholic Church in Arlington, Virginia, on Thursday, October 3 at 10:30 a.m. Interment Arlington National Cemetery. Expressions of sympathy in his memory may be made to a charity of your choice.